Prickly Pear Cactus in bloom © Arizona Sky Village (all rights reserved; used by permission). 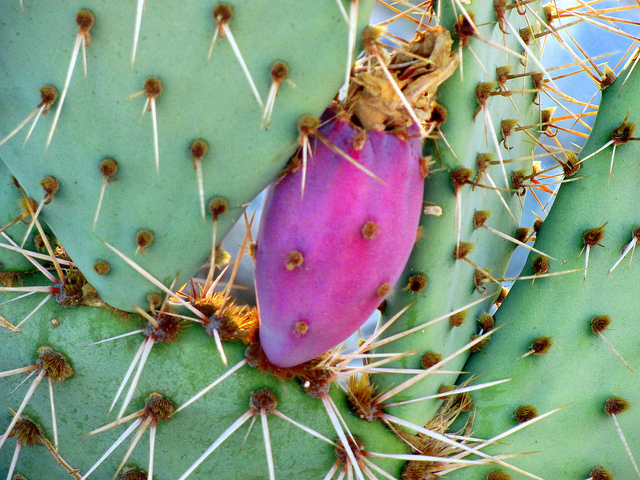 Found in the deserts of the American southwest, the fruits of most prickly pear cacti are edible, and have been a source of food to native Americans for thousands of years. Cacti in general (and the fruits in particular) are still staple foods for some residents of Mexico and Latin America and the prickly pear cactus is raised commercially. The fruit is sold under the name Tuna - the branches or pads are eaten as a vegetable (called nopalito or nopales). 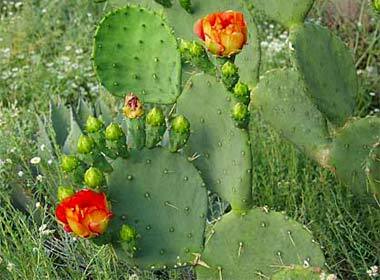 The name cactus is derived from the Greek word kaktos, which means prickly plant. Cacti and other succulents face a variety of threats in their natural environment. They are easily propagated from seeds and cuttings, so removing plants from their natural habitat is uneccessary and harmful to the delicate desert ecosystem. PRICKLY Prickly pear cactus; photo by Cary & Darla on Flickr (noncommercial use permitted with attribution / share alike).